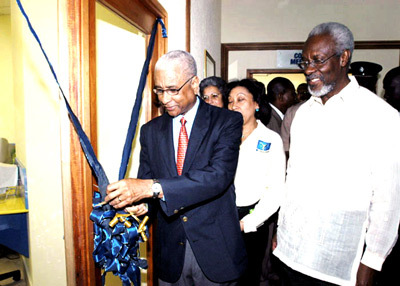 Errol K. Miller, Cable and Wireless Jamaica's vice-president for corporate communications and corporate affairs, cuts the ribbon to officially open the Grants Pen Cyberclub recently, while former Prime Minister P.J. Patterson looks on. Caption: PJ: hurry up nuh man, mi need fi use di toilet. Caption: Lady in white top: Wake mi up when dis dun!! Caption: Bwoy, Errol look like him could use a sharp pair of budget cutting scissors on dat ribbon..
Caption: How da watch deh look like fi mi suh? Caption: Cutting ribbons doesn\'t cut it, Mr. Miller, and P.J knows that. Caption: \"fly the gate and let in the pirate, we going show them a who rule.\"
Caption: Caption for the lady in the white blouse: \" Yawn!!! What is taking so long? zzzzz...\"
Caption: him just can\'t help himself him ha fi try fi the spotlight same way a fi mi turn now every bady cann se dat.